DelShakes' "As You Like It" Tours Community ...and We Like It! Danielle Leneé as Rosalind and Bi Jean Ngo as Celia. The Globe Theatre in London became world renowned by staging William Shakespeare’s histories, tragedies and comedies upon its wooden planks. Shakespeare was a shareholder in the Globe, which meant the more people he got into the building, the more money he made. The Globe became iconic and drew patrons from far and wide to see The Bard’s latest (brilliant) play. Delaware Shakespeare’s superb production of As You Like It does not have a permanent home like The Globe. Instead, the merry troupe of actors, musicians and staff are traversing Delaware this fall bringing The Bard to locations not typically hip to his iambic pentameter. Producing Artistic Director David Stradley told me he looks for spaces that can hold a seated audience between 40 and 120 people in a four-sided arrangement. Stradley stressed that Delaware Shakespeare searches for communities which may be underserved by the arts and whose residents might find difficulty traveling to Rockwood Park for its annual Summer Festival. The Community Tour is not just making stops, but introducing Shakespeare and the world of live theater to many people who’ve never experienced its wonders. I was pleased to see the actors welcome everyone who entered the cafeteria at Groves Adult High School in Marshallton. Cast members introduced themselves, who they would play, what we might expect, plus exchanged simple pleasantries. In this way, the space became very accessible. 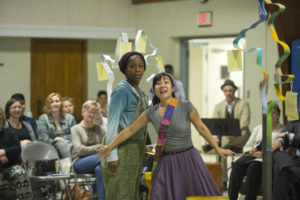 As You Like It follows its heroine Rosalind (Danielle Leneé) and her cousin Celia (Bi Jean Ngo) as they flee the court of Duke Frederick (J Hernandez), who is Celia’s uncompromising father. The pair put on disguises and escape into the nearby Forest of Arden along with court fool Touchstone (Adam Altman). Meanwhile, Rosalind’s suitor Orlando (Trevor William Fayle) has also fled into the woods to escape his exploitive brother Oliver (Jeffrey Cousar). The two lovers cross paths, but Orlando cannot recognize the inspiration for his many romantic poems. A variety of memorable characters also exist in the forest, notably the melancholy traveler Jaques (Liz Filios) who capably utters one of Shakespeare’s most famous speeches (“All the world’s a stage/And one man in his time plays many parts”). As previously mentioned, there are only eight actors playing the 20-odd roles in As You Like It. It’s marvelous to see Cousar and Hernandez play hot-tempered and then mild, love-struck men in the same production. Altman shined as loyal servant Adam as well as energetic and animated Touchstone. Merri Rashoyan filled four roles (and two genders) skillfully, with her Phebe being a highlight. Only Leneé (Rosalind) and Fayle (Orlando) played one part apiece — but those are meaty parts! As in any Shakespearean comedy, there is misdirection and love and misplaced blame and redemption — all done wonderfully in this production. A nice touch to the show were the small musical interludes by Joe Trainor (guitar/drum) and Filios (ukulele/accordion). After the show, Trainor told me that Shakespeare had sprinkled partial couplets and text into the script of As You Like It. As no record of a musical score existed, Trainor took it upon himself to compose period pieces to enhance the audience experience. Kudos! Director Madeline Sayet keeps the pacing brisk and encourages her actors to use the full space. The cast plays to all directions, which connects the action to the audience. Highlights of the show included the gymnastic wrestling contest between Orlando (Fayle) and Charles (Rashoyan); the ludicrously beautiful facial expressions of actress Bi Jean Ngo; the combined energy of the troupe; the cleverly made trees of Arden; and all those glorious words. If not for Shakespeare’s turns of phrases and rhythmic patterns, his 400-year-old plays would just be old dusty scripts. For instance, Rosalind’s advice on love to Phebe is simply beautiful and timeless. If, as Rosalind says, “Love is merely a madness,” then I hope newcomers to The Bard fall madly in love with his works, starting with Delaware Shakespeare’s As You Like It. The autumn Community Tour of As You Like It takes place in venues throughout Delaware from October 25 through November 12. Performances at Baylor Women’s Correctional Institution, Howard R. Young Correctional Institution and Ferris School for Boys are not open to the public. Admission is free with RSVP at info@delshakes.org or 302.415.3373. There will also be three ticketed performances ($15-$100) from November 10-12 at OperaDelaware Studios. Ever wonder what goes on in the Green Room before a theatrical performance? 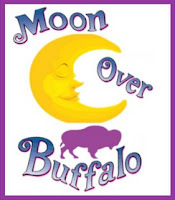 Moon Over Buffalo offers a peek…plus a whole lotta laughs at Wilmington Drama League. The year is 1953. The setting is Buffalo, New York (“Scranton without the charm.”) A touring company is performing Edmond Rostand’s Cyrano de Bergerac and Noel Coward’s Private Lives at the Erlanger Theater. George and Charlotte Hay (Alan Harbaugh and Sabrina Justison) boast a long-standing marital and acting partnership, both of which have frayed at the edges. Then they learn that the great film director, Frank Capra, needs to re-cast a movie he’s making and is flying in from New York City to see them perform. This could be just what they need to recoup the stardom they’ve lost and feel they so richly deserve. George has impregnated Eileen (Carolyn Peck), a young actress in the troupe. When Charlotte finds out, she tells him she’s fed up with his infidelity and is leaving him for their lawyer, Richard (Shawn Klein). Meanwhile, Rosalind Hay (Patricia Egner) has arrived to introduce her parents to her fiancé, Howard (Andrew Dluhy), a TV weatherman. He’s a geeky but affable TV weatherman who just happens to be a big fan of her parents. He loves Rosalind but is absolutely clueless about what’s going on, Rosalind, for her part, was in love with Paul (Luke Wallis), the Hays’ theatre manager, who still has feelings for her. Adding to the merriment is Ethel (Patricia Lake), Charlotte’s deaf-as-a-post stage mother who hates the boards George treads on and nearly brings him down with one innocent-looking coffee pot. Comic misunderstandings and mistaken identities abound. Ken Ludwig’s 1995 madcap farce is still fresh in 2017 and just the ticket for an evening full of fun and laughter. Let’s not forget that this play was worthy enough to lure Carol Burnett back to Broadway after a 30-year absence and, if you didn’t know better, this superb production might have you believe you’re sitting in a theatre on the Great White Way. It’s that good. Harbaugh and Justison simply melt into their roles. Harbaugh is brilliant as the very inebriated George. Peck applies just the right amount of affect to her role as the pregnant and distraught ingénue. Dhuly is convincingly clueless as the action swirls around him. Egner, Klein and Wallis know every nuance of their characters. Lake is downright hilarious as the hard-boiled stage mother/mother-in-law from hell. Kudos to the directorial team of Gene Dzielak and Melissa Davenport (as well as mentor/director Ken Mammarella) who pulled everything together. Also deserving of a standing ovation are Helene and Tony DelNegro for their retro 1950s backstage set, Cara Tortorice for her fabulous costumes and Lee Jordan for choreographing the playful duel between the Hays. “The Piano Quintet – Deconstructed” was the theme for the season-opening concert of the Delaware Symphony Orchestra’s Chamber Series Tuesday, October 17, in the Gold Ballroom of the Hotel du Pont in Wilmington. The concert featured an eclectic slate of works by Mozart, Ravel and Brahms as it showcased the talents of some of the most select members of the orchestra’s string section as well as principal pianist Lura Johnson. It’s always a pleasure to hear musicians of this caliber perform in an intimate setting, and they did not disappoint. The first half of the concert featured a pair of duos in keeping with the theme of the program. The concert opened with a performance by violinist Lisa Vaupel and violist Elizabeth Jaffe of Mozart’s String Duo in G major, a work Mozart is said to have ghost-written for Michael Haydn who was having problems filling a contractual obligation to Mozart’s former employer—and arch nemesis—the Archbishop Colloredo. Vaupel and Jaffe gave a lively reading of this much-performed work, with brisk tempos in the outer movements and much sensitivity in the slow movement. Violinist David Southorn and cellist Philo Lee tackled one of the 20th century’s masterpieces of the duo genre: the Sonata for Violin and Cello by Maurice Ravel. This work generated lots of intermission discussion among concertgoers who expected something like the sultry and sensuous Bolero rather than this lean and linear work. Like many of his contemporaries, Ravel searched for new modes of expression and style following the horrors or World War I. And while that drew him to certain aspects of Neoclassicism, he never totally abandoned his use of traditional forms nor did he reject the legacies of his immediate predecessors. Thus, the Sonata for Violin and Cello exhibits the “economy” of late Debussy, the rhythmic drive of Stravinsky and a more contemporary austerity. Southorn and Lee delivered this demanding work with energy and virtuosic precision, carefully etching and capturing its herky-jerky rhythms and acerbic bi-tonal clashes. The string players assembled onstage—accompanies by pianist Johnson—after intermission for a performance of Brahms’ Piano Quintet in F minor. This is a large-scale work, dark and dramatic and the ensemble conveyed that Romantic intensity in the outer movements and the relentless third-movement Scherzo, and gave a soulful reading of the Andante. Yet as heated as the music got, it never lost its transparency. Contrapuntal lines played off against each other without conflict and the several fugato passages were particularly successful. Johnson for her part fit seamlessly into the mix, using the percussive power of her instrument to support rather than dominate. And the felicitous turns in Jaffe’s viola and Lee’s cello were never buried. Still, the ensemble produced a solid, powerful sound. 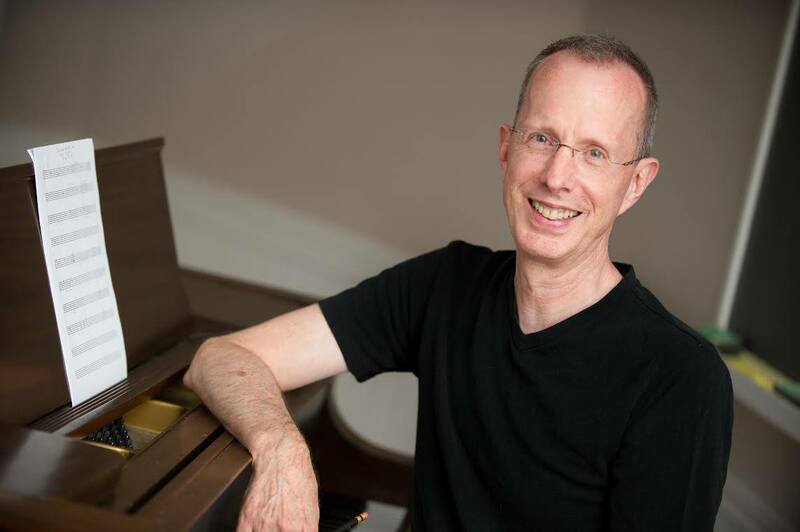 Organist/composer David Schelat explored the Baroque and beyond Saturday, October 14, kicking off a brand new season of Market Street Music at First & Central Presbyterian Church on Rodney Square in Wilmington. Schelat’s program traced J.S. Bach’s steps back to his admirer Dietrich Buxtehude then forward to his “rescuer” Felix Mendelssohn as well as offering a sampling of Bach himself. The first half of the program featured three Baroque “Bs”: Bruhns, Buxtehude and Bach. Their work spanned the years 1664-1750, a time when north German mercantile trade funded both composers and construction of pipe organs on increasingly grander scales. The music of this period was largely improvisatory and known as stylus fantasticus, characterized by short contrasting episodes and free form. Bruhns’ Praeludium in E Minor exemplifies this style and Schelat delivered it with insight and intelligence, maintaining the thematic material clearly while providing auditory interest in the repeated ornamentation with a variety of colorful registrations. Buxtehude’s O Morning Star, how fair and bright (Wie schon leuchtet der Morgenstern) again showed Schelat’s expertise with the articulation of Baroque musical gestures. Bach received his due with a rendering of the Prelude and Fugue in G Major (BWV 541) that was both meaty and full of energy. Tucked between them was the melodic simplicity of the chorale prelude Blessed Jesus, we are here (Liebster Jesu, wir sind hier (BWV 730). From Spain came Juan Cabanilles’ Corrente Italiana, a mixture of Renaissance and Baroque. Schelat added a subtle touch of percussion to good effect. There were more surprises following intermission, including an organ sonata by C.P.E. Bach, J.S. Bach’s second surviving son. Although much better known for his harpsichord works, Bach did produce six organ sonatas on commission from Princess Anna Amalia, sister of his then employer, King Frederick the Great of Prussia. The writing is for manuals only, because the Princess was — reportedly — unable to play the pedals. Schelat offered an effervescent rendering of the Sonata No. 5 in D Major (Wq70), indulging in much hopping between the two manuals — and adding a bit of pedal — to create a sheer delight for the ear. Another pleasant surprise came with a performance of the Andante sostenuto from Charles-Marie Widor’s Symphonie Gothique. This sweet, meditative piece allowed Schelat to reveal a whole other side to a composer better known for the pyrotechnics of his Toccata in a work we rarely get to hear. The program concluded with a performance of Mendelssohn’s Sonata in B-Flat Major. Mendelssohn had a great love for Bach and played a major role in his revival. While this music is Romantic in its approach, it displays a certain restraint which is very appealing. Schelat obviously loves this music and that affection came through in this assured and sensitive delivery. Schelat reached into his own catalog for an encore with a performance of Kokopelli, a whimsical piece dedicated to the flute-playing trickster deity who represents the spirit of music and who presides over childbirth and agriculture. Schelat wrote the piece for the Fred J. Cooper Organ Book, which was commissioned by the Philadelphia chapter of The American Guild of Organists to celebrate the 10th anniversary of the organ in the Kimmel Center’s Verizon Hall. 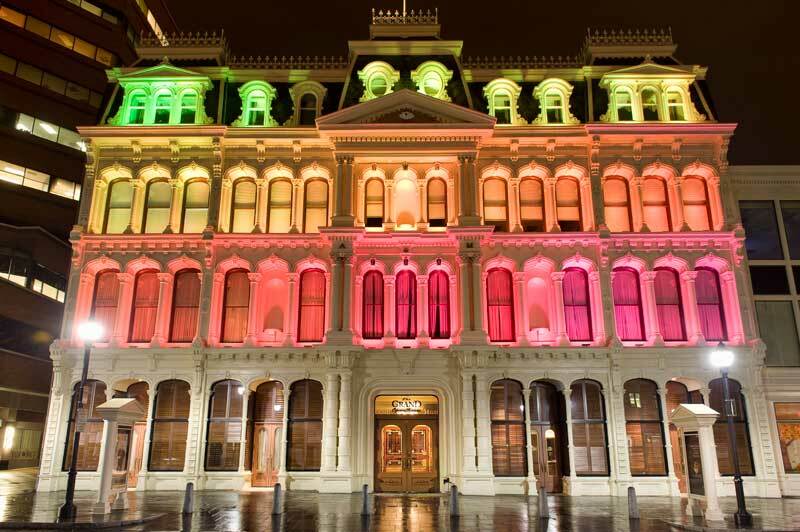 Photo courtesy of The Grand Opera House. The Grand staff and board, under the Executive and Programmatic leadership of Mark Fields and Stephen Bailey, is excited to announce that the performance arts company has set a one-day ticket sale record, selling over 6,000 tickets on Monday, October 9, 2017. Currently, The Grand has over 70 shows on sale, ranging from America’s Got Talent finalist TAPE FACE (10/14), to long-time comedy icon SINBAD (12/15), music mavens STRAIGHT NO CHASER (11/29), and Broadway’s finest like THE WIZARD OF OZ (11/14-11/19) and MOTOWN (5/1-5/6). 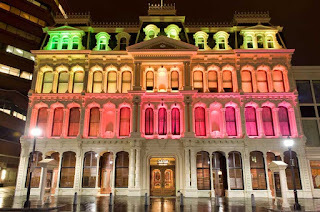 Tickets can be purchased online at TheGrandWilmington.org, by phone at 302.652.5577 or by visiting The Grand’s Box Office at 818 North Market Street, Wilmington, Delaware. If it were possible to gather together composers — both living and dead — and ask them who they thought was the greatest composer of all time, chances are one name would surface more than others: J.S. Bach. And with good reason. Bach is one of the few — maybe the only — composer to succeed in combining masterful craftsmanship with such profound expressivity. TheMusic School of Delaware used the artistry of J.S. Bach to say thank you to its patrons for their generosity on Wednesday, October 4, as it opened another season of its Music Masters Concert Series with an all-Bach program. Maestro Simeone Tartaglione led a 15-member chamber orchestra comprised of music school faculty and guest artists. Tartaglione bookended the program with two works from Bach’s most imaginative and celebrated oeuvre: the Brandenburg Concertos. The concert opened with a formidable rendering of the short but robust third Brandenburg. Bach composed two substantial movements for this work, leaving the players to improvise a transitional movement, for which he provided only two chords. Tartaglione and his players executed the Allegro movements at an authentically robust tempo. Bach’s contrapuntal mastery was vividly brought out by this ensemble that interacted with each other like the cooperative soloists Bach intended them to be. Concerto No. 5, however, makes demands on the harpsichord soloist that far exceeds anything else in the repertoire. As Tartaglione pointed out, this work is, for all intents and purposes, the first keyboard concerto. Bach gives the harpsichord (here in the capable hands of Tracy Richardson) a most unusual role: it starts out playing a basso continuo, proceeds to play solo melodies in dialogue with the flute (Dr. Lynne Cooksey) and violin (Christof Richter) and then gets carried away with virtuosic scales that leave the others in the dust. Richardson delivered with great panache and rhythmic sensibility, showing what top-tier musicianship can bring to a familiar work. Christof Richter soloed in a polished performance of the Violin Concerto in E Major. The opening is Bach at his sunniest, and Richter and the group exuded pure joy as they eased into the mellow mood this music demands. The expressive Adagio was exquisite as it contrasted a dark intensity with moments of golden light. The finale was cheerful and full of energy. Dr. Lynne Cooksey was equally impressive in the Suite No. 2 in B Minor. Cooksey played with style and agility, executing the piece’s fast passages with note-perfect ease, playing a lovely duet with the cello in the sixth-movement Polonaise, producing lovely sighing effects in the Menuett and pulling out all the stops in the appropriately fast final-movement Badinerie, earning her a round of enthusiastic applause from the very appreciative audience. There’s no denying Karen Flint’s contribution to the cultural life of our region. 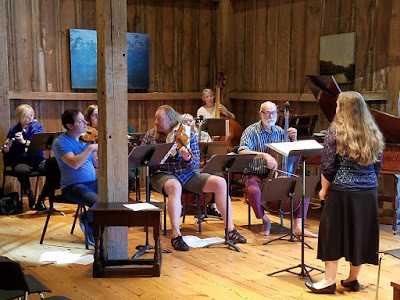 Brandywine Baroque orchestra members rehearse "The Woodman." Photo courtesy of Brandywine Baroque. As founding artistic director of Brandywine Baroque, harpsichordist Flint consistently presents programs that feature works by the well-known and not-so-well-known — though no less worthy — composers of the period. Moreover, her collection of rare (and playable) harpsichords draws devotees and scholars from around the country and the world to the Centreville venue, The Barn at Flintwoods. Flint and company opened the 2017-18 season with a performance of as rare a gem as any: The Woodman (1791) by English opera composer William Shield. This all-but-forgotten work is so obscure that Flint and fellow harpsichordist Janine Johnson had to prepare an orchestration from a piano/vocal reduction, the only existing score for the opera. fact, it was once thought that he wrote Auld Lang Syne, the melody of which appears toward the end of the overture to his Rosina opera. It is now thought that both he and Burns borrowed the melody — or at least the outline of it — from an old folk tune. Shield’s work is considered to be the forerunner of the modern musical comedy. The Woodman contains features associated with later English comic opera, including spoken dialogue, a frothy theme and the use of popular and folk melodies. The music is pastoral, even bubbly, with flashes of coloratura. The plot is a madcap thicket of love found, lost and recovered. Emily (Laura Heimes) has fallen in love with Wilford (Stephen Ng) but his nasty uncle does not approve and sends him off to Europe. When Wilford returns, Emily has fled to the forest where three other men fall in love with her. Mistaken identities and all sorts of mischief follow in this lively romp through the woods capped off by a female archery contest for a price heifer. Flint assembled a stellar cast of singers and musicians for this superb rendering of this woefully overlooked gem. Heimes is vocally striking — as usual — in her portrayal of Emily. Ng brings a full-bodied tenor and lovelorn urgency to Wilford, her lost love. Bass Daniel Schwartz excelled in his portrayal of the upright and kindly Fairlop, the woodman, while sopranos Abigail Chapman and Rebecca Mariman were convincing as his daughters, the steady Dolly and coquettish Polly, respectively. Baritone James Wilson played the lecherous Sir Walter to the hilt accompanied by his ever-loyal sidekick Medley in the capable hands and voice of tenor Andrew Fuchs.Tenor Lawrence Jones displayed a much misplaced confidence as he assisted Wilford in his quest to find Emily. But it was countertenor Augustine Mercante, wigged in bight orange ringlets, who elicited the most laughter in his portrayal of Miss Dinah “Di” Clackit. Mercante not only possesses a sumptuous voice but also impeccable comedic timing that never missed a beat. Eileen Grycky, violist Amy Leonard, double bassist Heather Miller Landin served as archers (Grycky also played Bridget the maid). Violinists Martin Davids and Edward Huizinga played Filbert, the Gardener and Bob, respectively. Imaginative costumes and props transported the audience from Centreville to an 18th Century English forest. of Mélomanie. Photo by Tim Bayard. 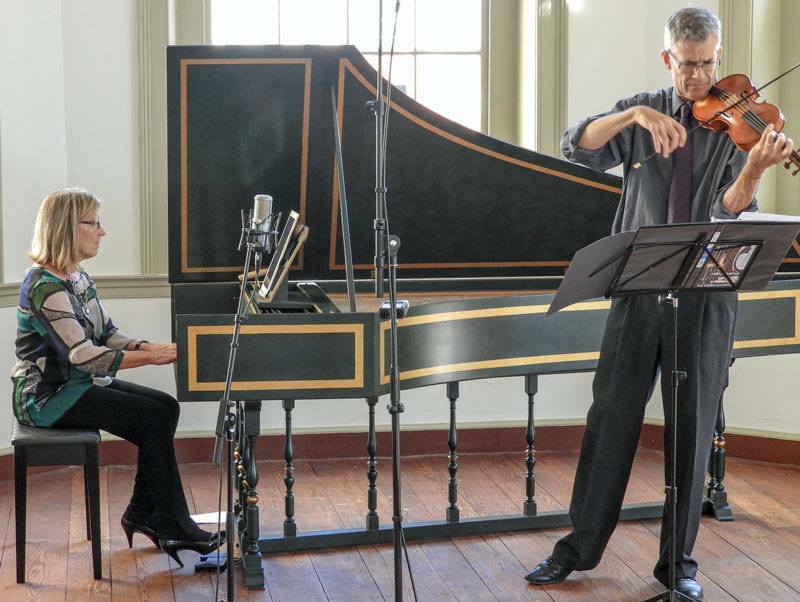 Mélomanie members Christof Richter (violin) and Tracy Richardson (harpsichord) combined their talents to showcase the versatility of the violin in a program that featured works by the well-know, the not-so-well-known and the downright quirky. The concert, called 'Up Close & Personal: The Violin,' took place on Saturday, September 30, at Old Town Hall in downtown Wilmington. Despite the role it plays in the modern orchestra and the repertoire that’s grown up around it, the violin was considered a “low-brow” instrument, played largely from memory throughout the late 16th and early 17th Centuries. But once written music appeared, the violin became a major driver in the development of instrumental music as a whole. Saturday’s performance opened with a performance of Johann Paul von Westhoff’s Partita 6 in D Major for solo violin. Unlike his contemporary Heinrich Biber, little attention has been paid to von Westhoff. But lesser-known hardly means insignificant. In fact, it is very likely that von Westhoff met J.S. Bach during their time in Weimar, and that these Partitas were a direct inspiration for Bach to compose his sonatas and partitas for solo violin. Richter performed with a natural and effortless charm, concluding with an exhilarating reading of the Gigue. Heinrich Biber — von Westhoff’s more famous contemporary — was represented with a performance of Sonata 4 in D Minor (The Presentation) from his Rosary Sonatas. This ever-intriguing work is the finest example of Biber’s exploration of scordatura, alternate tunings of the violin strings that produce otherworldly sonic textures and performance challenges. The Presentation is a chaconne and variations tuned to D minor. Tuning the top string down a step and the bottom string up one produced an alto-like quality, where one would expect soprano brilliance. Richter’s execution of these blazing virtuosic variations was breathtaking, making the listener long for a full performance of this work. The Italian Baroque was represented by Biagio Marini’s Romanesca Variations and Giuseppe Tartini’s Sonata in G Minor (The Devil’s Trill). “Romanesca” is actually a song form popular in the period 1550-1650, characterized by a sequence of four chords which form the groundwork for improvisation (think: Greensleeves). The work consists of four variations and two dances, the gagliarda and corrente. Richter and Richardson took a spirited approach with regard to tempo and meter long before the dance variations impose triple meter toward the end. Richter imbued Tartini’s Sonata with the appropriate pyrotechnics: delicate turns and swift runs, dark moods, commanding multiple stops and double-note trills. And while the work can be performed solo, the inclusion of the continuo added depth and harmonic texture. Richter and Richardson made a fine duo in Mozart’s Sonata in G Major (KV 301). Richter’s intonation is always exact and his articulation in the fastest passages clear and precise. These sterling qualities were matched by Richardson’s accompaniment on harpsichord, which she notes was still in use alongside the up-and-coming fortepiano during this time. No Mélomanie concert would be complete without some contemporary offerings. In an afternoon of surprises, there were some pretty interesting choices. Schnittke’s Suite in Old Style is a wry nod to the Baroque — actually a pre-Classical-style pastiche of movements drawn from the composer’s film scores. Unlike a true Baroque suite, though, there is little for the soloist to show-off. Richter brought a fragile delicacy to the final movement, Pantomime, the only movement performed in this program. Richter and Richardson offered yet another interesting piece from a most marginalized 20th Century composer, Josef Matthias Hauer. Hauer’s claim to fame (or infamy) is that he developed his own 12-tone system, publishing his findings in 1919 slightly ahead of rival Schoenberg. But whereas Schoenberg manipulated tone rows, Hauer based his atonality on systematically organized chords. Toward the end of his life, Hauer wrote a collection of short (the longest runs five minutes) pieces called Zwolftonspiel, literally 12-tone games. Richter and Richardson collaborated on the one dated 26 August, 1948. This music is a welcome respite from the angular tones of Schoenberg’s serialism, and Richter and Richardson captured its joy and playfulness in this very capable rendering.